Our Mission is to treat our patients in the same way that we would want to be treated ourselves. This means preventing pain during the procedure; and also practicing at an extremely high level of care to ensure that your microscopic endodontic treatment results in you being able to keep your tooth for as long as possible. Our quality first emphasis shapes the way we schedule patients, discuss treatment options, and deliver endodontic treatment. We take pride in delivering endodontic treatment that utilizes some of the latest techniques and technology available to our specialty. Dr. Koehn performs each procedure through a microscope; and uses digital radiography for high resolution images with much less radiation than traditional films. Dr. Koehn has also incorporates 3D imaging technology to help find canals and properly diagnose endodontic pathology even before he starts the procedure! Painless treatment experience is our goal. Dr. Koehn's anesthetic techniques and patience helps him ensure that each patient should be very comfortable throughout the procedure. He also has invested in The Wand anesthetic delivery system, which allows patients to experience very little discomfort if any during anesthetic placement. Financing options are available to help prevent delay in treatment. We have found that 3rd party financing can be helpful in making microscopic endodontic therapy and dental implants affordable for many. Please see our financing options through Care Credit. 3D imaging sets our practice apart! 3D technology has given Dr. Koehn's patients a tremenous advantage in getting excellent care, accurate diagnosis, and appropriate treatment. Have you ever had a tooth root canal treated... only to have it fail later for unknown reasons? Have you ever had difficult to diagnose sources of dental pain? The truth is that every tooth is unique. Teeth can harbor hidden areas of infection not visible with traditional x-rays. 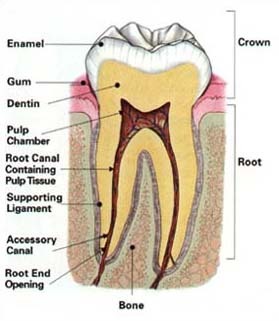 Sometimes a previously root canal treated tooth can get re-infected because it has more canals present than normal. If all of the canals are not found and treated inside a tooth, future reinfections can develop. 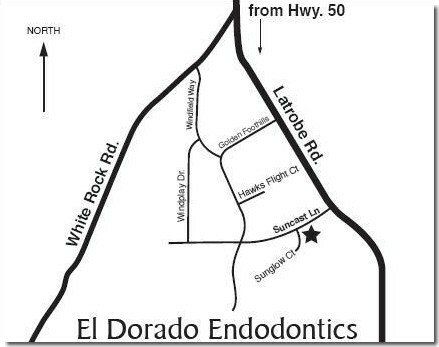 In 2010, Dr. Koehn became one of the first endodontists in the greater Sacramento area to incorporate 3 dimensional imaging into his practice. In addition to Dr. Koehn's use of a microscope throughout each case to help find canals, he has the advantage of looking inside a 3D virtual reconstruction of your tooth BEFORE treatment ever begins. Much of the detective work of finding canals and finding sources of pain has been eliminated with 3D imaging at El Dorado Endodontics. 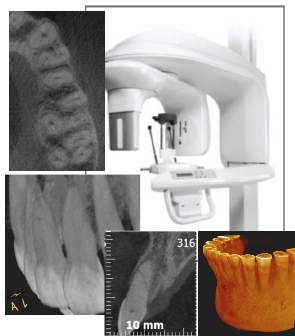 The Kodak 9000 3D focused field system (cone beam computed tomography) offers the finest 3D resolution available to endodontics, while using less radiation than a digital panoramic x-ray. 3D imaging has drastically altered the course of treatment and diagnosis for many patients due to findings that never would have been detected in 2D. El Dorado Endodontics can now avoid the “Watch and Wait” recommendation for many of those difficult to diagnose cases! First and foremost, we believe that people in our office should be treated and cared for in the same way we would want to be treated. We strive to provide you with a relaxing and comfortable treatment experience. We welcome any feedback from you about your time with us and what we could do to make your visit the best it can be! Dr Koehn thoroughly explains to each patient what a root canal is about to help you understand the value in the care that we give. What is a root canal? During treatment you have the option to view a movie or listen to music with headphones. We have invested in Tempurpedic dental chair overlays to make your time in the chair more relaxing. If anti-anxiety medication would help you relax, let us know in advance. After Dr. Koehn sees you for a consultation and reviews your medical history (which you can fill out online prior to your appointment), he will likely be able to prescribe an anti-anxiety medication for you to take prior to your appointment and even the night before if it will help you sleep. In most cases, California law mandates that we monitor your vital signs with this oral conscious sedation, so an additional fee would be required to help cover costs for the additional time and care involved. A driver is necessary to bring you to and from your appointment for your safety. We also would need for you to visit our office personally prior to your treatment appointment day for a consultation and to sign consent forms prior to taking anti-anxiety medications. We are pleased to offer outside financing for patients who would benefit from being able to make payments to receive quality root canal therapy or dental implants for teeth that are not savable. Dr. Koehn will only recommend root canal therapy if it is in your best interest. If your tooth is better off either without treatment or if removal is needed instead, He will discuss options with you and recommend what he thinks is best for you. We welcome and appreciate any referrals you make to our practice. You will find our practice philosophy is evident in the way each patient receives the utmost attention to detail and care. Microscopes, 3D technology, and advanced techniques help us provide a high level of care to our patients. Appointments are scheduled to give patients Dr. Koehn’s undivided attention. A thorough evaluation is performed to ensure an accurate diagnosis is achieved. Digital radiographs, microscopic photographs, and chairside drawings are shown to explain and document each case for the patient and referring dentist. 3D imaging at our office provides a tremendous advantage for our patients. 3D images of teeth and surrounding structures has greatly enhanced our ability to accurately diagnose and treat cases with precision. Pictures of findings can be emailed to referring dentists or to another specialist. Every case is performed with a high-powered microscope to ensure that complex canal anatomy is accounted for and to help raise the level of success in endodontic treatment. Referring doctors have the ability to refer patients online and view post-op results online after a case is completed. Coronal endodontics can be performed at the request of your dentist (such as bonded cores, fiber/resin posts, etc) to ensure no risk of leakage or contamination occurs between the finished root canal and the permanent restoration. Treatment will only be recommended and given if it is in the best interest of the patient. After hours appointments may be available for emergencies, however an after hours emergency fee would be necessary. Your general dentist sometimes refers patients for consultation when the diagnosis is complicated or when treatment is more difficult than normal. Aside from providing treatment, Dr. Koehn's role is also that of educator. It is important that patients understand why they require treatment, what treatment involves and what they can do to ensure the best possible outcome. Dr. Koehn believes that a properly informed patient has the best chance of achieving the optimal result. The Endodontist removes the inflamed or infected pulp, carefully cleans and shapes the canal system and then seals the prepared space. Most treatment is now performed in a single appointment ranging from 45-120 minutes (depending on the number of canals). Once treatment is completed, you will be instructed to return to your dentist for permanent reconstruction. The restoration of the tooth is an important part of treatment because it seals the cleaned canals from the oral environment, protects the tooth and restores it to function. Usually it is imperative to seek a final filling or crown from your dentist within a month or less after your root canal treatment if your tooth feels great to ensure that your tooth does not fracture, or that your root canal will not get re-infected and need to be redone. For the first few days after treatment, there may be some sensitivity to biting pressure, especially if there was pain or infection before the procedure. Sometimes over-the-counter anti-inflammatory medications (like Advil) are recommended for a day or two. Dr. Koehn can prescribe other medications but they are rarely required. 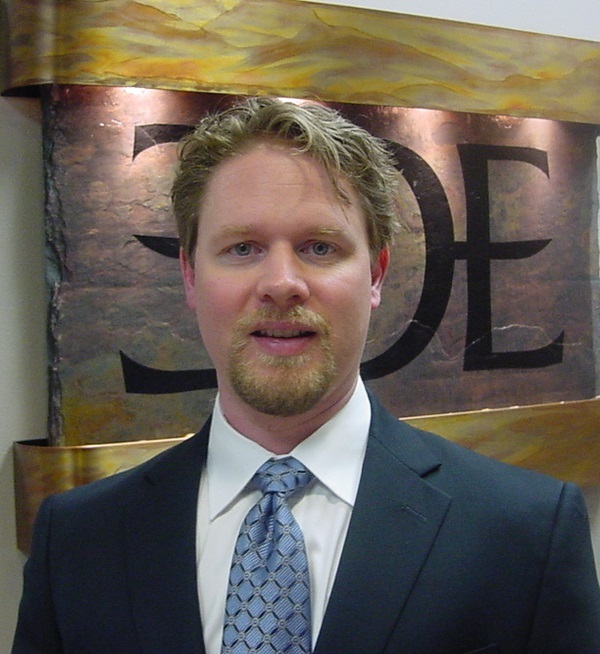 Thank you for choosing Dr. David P Koehn for your endodontic care. We are committed to providing you with the highest quality dental care possible, but in order to achieve our goals, we ask for your cooperation in being responsible for your dental bill. We are pleased to offer Care Credit (3rd party financing) to our patients. Payment plans can make needed treatment affordable. You can apply right now online, and have your approval in place prior to your appointment with us! Click on the links above for more information. In order to achieve our goal of providing care that is exceptional, we kindly ask for your cooperation in being responsible for your dental bill. Fees for service are due at time of treatment. For your convenience we accept: VISA, MasterCard, AmEx, Discover, Debit Card, Personal Check, Cashier's check, Money orders and cash. You, the patient, are ultimately the responsible for the entire amount of fees for service. Payment (of your balance, co-payment, or fee for service) is not due until either your insurance pays their portion*, or until 30 days** after your appointment day, whichever comes first. If your insurance payment does not arrive within 30 days of your appointment, we reserve the right to charge the full fee for service to your pre-authorized credit card. Then we will promptly send you a refund check for any overpayment in the mail once the insurance payment is received. 3. Print out your claim for you to read and follow up or verify as accurate with your insurance. We find that insurances may pay more readily and faster (ideally within your 30 day window) if their clients (you) call. * Possible exceptions to this include: patient who have Delta Dental insurance, or any circumstances in which it is likely that the insurance is already maxed or will not cover a procedure, (i.e. implant procedures, etc. ), or will not send directly to us their portion of payment. In such instances, either estimated co-payment (along with credit card pre-authorization) or fee for service will be collected at time of treatment. ** "30 days" means that it needs to arrive on the last business day of 30 days, with day one being your appointment day. Our business days are generally Monday – Thursday excluding holidays and vacations. By signing this financial policy, you are agreeing to: give El Dorado Endodontics permission to pre-authorize your credit card for the full fees for service onto your credit card; and within 30 days** of your appointment you authorize El Dorado Endodontics to charge the exact remaining balance due, whether or not your insurance has paid a portion of that balance by that time. If there has been an overpayment once insurance pays, we will promptly send a refund check to you. Possible exceptions are listed*, meaning that Delta Dental patients agree (if necessary) to pay at least their co-payment amount on the day of service, in addition to pre-authorizing a credit card. Patients with special circumstances for whom these options will not work, agree to pay the full fee for service amount at time of service. Once an appointment has been made, this time has been reserved exclusively for you with appropriate staff to serve your dental needs. Canceling without adequate notice makes it difficult for us to meet the needs of other patients. Missed appointments or cancellations with less than 2 business days notice prior to your appointment will incur a maximum charge for missed procedures of $1509 per procedure if multiple procedures are planned) and a $180 charge for missed consultations. If there is a second offense, then the full cost of treatment planned will be charged for the missed appointment. The charge is necessary to defer the overhead costs involved with missed appointments, and to keep missed appointments to a minimum. This in turn keeps our normal fees reasonable. Teeth are sometimes found to be non-restorable during treatment. Although part of the diagnostic work up is to find these things prior to treatment, if a tooth is found to have damage that is not repairable (deep fractures for example) during treatment, an incomplete RCT fee of $659.00 will be incurred plus exam and radiographs. After root canal tx, it is your responsibility to get a final restoration from your dentist w/in 1 month unless otherwise instructed. If you fail to do so, you may need your root canal to be redone, or you may fracture your tooth causing the need to have it removed. The full cost of retreating or removing your tooth will be your responsibility if the temporary filling is left in too long. 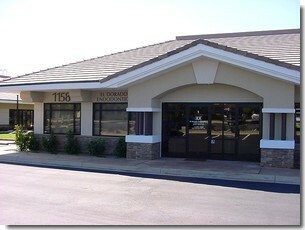 Dr. Koehn / El Dorado Endodontics is opted out of Medicare. No claim will be submitted to Medicare from the provider or the patient. Medicare will not make any reimbursement for any services. It is our policy to charge interest of 1.5% per month (18% Annual Percentage Rate). This will be applied to accounts over 30 days past due. We will charge $30.00 for returned checks. A common point of confusion is about how an insurance company determines UCR (Usual and Customary). Inflammatory information is often sent by the insurance companies that may state our fees are higher than usual and customary. An insurance company surveys a geographic area, calculates an average fee, takes 80% of that fee and considers it customary. Included in this survey are discount dental clinics and managed care facilities, which bring down the average. Many plans tell their participants that they will be covered "up to 80 percent or up to 100 percent," but do not clearly specify plan fee-schedule allowances, annual maximums or limitations. In fact, “80% of UCR” many times is not even calculated by the fees in the area but instead is some arbitrary number so the company can sell the plan to your employer at a specific cost per person. Hence, it may not represent a practical fee for a given procedure. It is more realistic to expect dental insurance to cover 35 - 65% of major services. Remember the amount a plan pays is determined by how much the employer paid for the plan. You get back only what your employer put in, less the profits of the insurance company. Dental benefits differ greatly from general health insurance benefits. In 1971, your dental-insurance benefits were approximately $1,000 per year. Figuring a 6% rate of inflation per year, you should be receiving more than $4,549 per year in dental benefits. Your premiums have increased, but your benefits have not. Therefore, dental insurance is never a pay-all; it is only an aid or supplement. The cost of handling insurance within our office includes numerous lengthy phone calls, resubmitting information or radiographs (x-rays) two or three times because insurance companies "lost" or "never received" them, excessive paperwork, mailing and redundant billing. Hence, the cost of handling insurance is not trivial and really is substantial. Patience is involved since it takes at least 1 month for claims to be processed; it’s not unusual for 3 months and sometimes longer! Dr. Koehn takes pride in practicing with excellence as the first priority for each patient. It may be surprising to patients that there is a wide range of quality of care in root canal treatment. Dr. Koehn strives to provide the highest level of care for each patient. A long term successful result is important to Dr. Koehn. What is an Endodontist? "Over the years, I have referred many patients to Dr. Koehn knowing that they would receive state of the art care from an endodontist who has a reputation for excellence among dental professionals. It wasn't until I needed a root canal treatment myself, that I experience first-hand Dr. Koehn's high-tech yet very gentle technique. This is my unsolicited testimonial... you are in good hands with this good man and his dental team." I've had several Root Canal treatments and this one by Dr. Koehn was by far the easiest. Must be the ideal combination of superb technology AND masterful technique! Easiest root canal I have ever had! This was the best experience that i have had at any dentist. I did not have good experiences with rool canal treatments before but this time was surprisinglty different: No pain! It is great that you can watch a movie during the treatment. It is also great that you have a questionnaire. It really shows you care about your patients and your level of competency and caring. Keep up the good work. Post op comments from: Morgan. I was dreading this procedure and I was so suprised how well it went (...) I will recommend your office to anyone I know that is in need of your services. Thanks again. (...) I was very nervous and afraid of the procedure especially since I no longer have any “pain pill” to take for relief. Thank you very much for a painless visit and I appreciated the follow up call yesterday." I would recommend Dr. Koehn to anyone that needs a root canal done. He's done 2 of mine and IF I ever need another, he'll be the one I choose. Thank you so much for getting me in right away! I was in so much pain, and now I feel great! I'm empressed with Doctor Koehn, the staff and the state of art facility. I'm very satisfied with my procedure. Yes, for most root canal treatments, we recommend that patients return to the office between six months to one year after the procedure was finished. Our office will send a reminder notice to you when you are due for a recall appointment.